Posted on May 12, 2008 by D.C. LAPTOP Magaazine has put together an article comparing the 8.9-inch Asus Eee PC 900 (which just became available in the US) with the 7-inch Asus Eee PC 701. Both models compared are running Linux. The upgraded features of the Eee PC 900 are compared to the original 701 (such as the larger touchpad with multi-finger scrolling – FingerGlide, higher-resolution display, better camera, more storage). 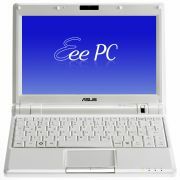 As pointed out, the 7-inch Eee PC 701 does have a longer battery life and lower price, however the Eee 900 is considered a better choice overall in the comparison. This entry was posted in ASUS, Netbook, Reviews. Bookmark the permalink.